While most people are familiar with standard 60 degree tapered acorn style lug nuts, many full size trucks with hub-centric wheels use flat flange style nuts and smaller lightweight vehicles like buggies and UTVs often use ball style lugs. NEW! - Need help with bolt patterns and lug nuts? Check out the new comments section below! 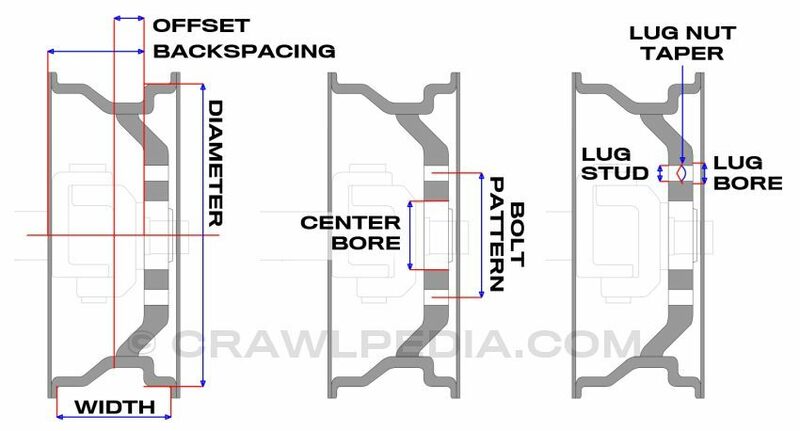 Bolt patterns with an even number of lugs are measured from bolt center to bolt center while 5 lug bolt patterns are measured from the top of the upper lug to the center of the lower lug. To find your bolt pattern, measure the distance as accurately as possible and then find the corresponding bolt pattern in the conversion table below. For example, if you have a 5 lug wheel and your measurement is 5" then your bolt pattern is 5 x 5" (5 x 127mm). Bolt pattern data is ©Copyright Crawlpedia.com - Please provide a link back to this page when copying. Data is accurate to the best of our knowledge through 2008 and is offered as-is with no guarantee.